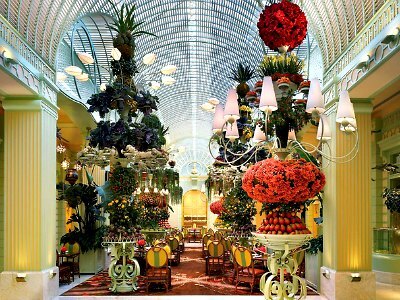 The Wynn Hotel Las Vegas is one of the most luxurious hotels on the Strip. Steve Wynn opened this all suite property in 2005 and he has continued to improve the complex year after year. The Wynn Hotel Las Vegas is on the upper scale of expense and once you enter the property you will be amazed by the personal service, excellent décor and opulent gardens. The complex features over 2,000 suites that range in size from 640 to 3,200 square feet and each suite is furnished with the fabulous Steve Wynn Dream Bed. Views from the Tower Suites are spectacular and may include the Strip, Lake of Dreams or the Wynn Golf Club. 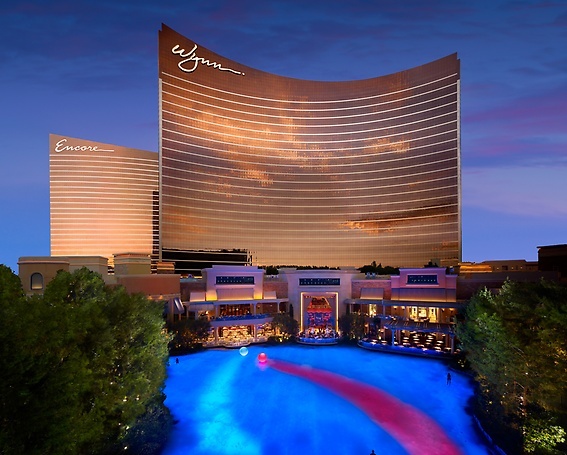 The atmosphere is electric at Wynn with quality entertainment choices such as Le Reve-The Dream show that is performed partially underwater by amazing acrobats and swimmers. The Lake of Dreams boasts a ninety foot waterfall down a tree covered mountain and several restaurants offer lakeside dining such as Lakeside Seafood and the SW Steakhouse. 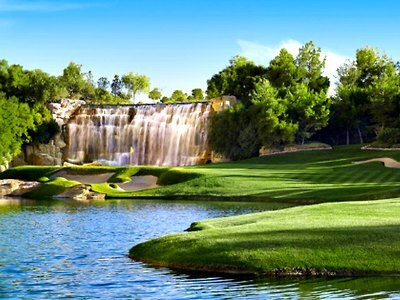 The Wynn Hotel Las Vegas is the only hotel complex that has an eighteen hole golf course inside the complex. 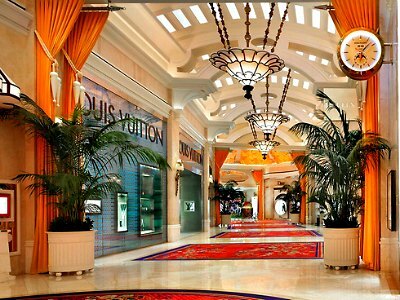 Shopping is short stroll down the Wynn Esplanade that features luxury brands like Chole, Cartier, Dior, Louis Vuitton and many more. The amenities at Wynn are second-to-none, in Las Vegas and everything associated with the property has the personal touch of Steve Wynn. The Wynn Hotel Las Vegas is an all-suite property with the accommodations being some of the newest in Las Vegas. Since the hotel’s completion in 2005 the Wynn continues to upgrade amenities and the contemporary décor that is featured in each suite. All suites are furnished with marble foyers and bathrooms as well as the incredible Steve Wynn Dream Bed that assures you will enjoy your sleep. The Wynn Deluxe Resort, Deluxe Panoramic and the Panoramic Corner suites are large at 640 square feet and they boast a living area that includes a dining table, work area, sofa, wet bar and your choice of a king or two double sized beds. The bathroom includes a dual sink vanity, soaking tub and a walk-in shower. The suites located in the Wynn Tower offer upgraded amenities such as a private pool, complimentary breakfast at Tableau, twice daily maid service, fitness center and there is no resort fee collected from the guest. The Wynn Tower Suite is similar in size and floorplan as the resort suites as well as available with a king or two double sized beds. The Executive Tower Suite is 933 square feet of luxury. The suite has an enlarged living area that includes a sofa, dining table, minibar, work desk, king size bed and a nice closet. The suite contains his and hers bathrooms with a soaking tub for her and a walk-in shower for him. The Parlor Suite comes in at 1,280 square feet with an extended separate living area that includes a wet bar, sofa, chairs, dining table, work desk area and a half bathroom near the foyer. The bedroom has a king size bed with a nice sitting area and a large bathroom that includes a dual sink vanity, large wardrobe closet, a soaking tub and an oversized shower. The Salon Suite has 1,800 square feet of luxury at its finest at the Wynn Hotel Las Vegas. The enlarged separate living room includes two sofas, a wet bar with counter, a dining nook, a separate massage room and a half bathroom off of the foyer. The bedroom includes a large sitting area with furniture and the bathroom features a dual sink vanity, two closets, makeup area, soaking tub and an oversized shower. The Fairway Villa is available in a 2,400 square feet one-bedroom and a 3,200 square feet two-bedroom. The villas overlook the manicured Wynn Golf Club and also feature two patios. The large separate living room includes numerous sofas, chairs, a wet bar with counter seating, a large dining table, a separate massage room and a half bathroom off of the foyer. The bedroom includes a sitting area as well as his and hers bathrooms that feature a shower, soaking tub, makeup area and large closets. Steve Wynn has brought some very exciting entertainment to the Wynn Hotel Las Vegas. 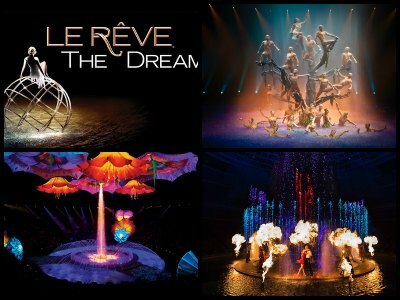 The acclaimed aquatic show Le Reve-The Dream features sophisticated synchronized swimmers, high divers, acrobats, dancers and singers in a lively show that is presented by Franco Dragone. Dragone is famous for his work with Cirque du Soleil and this show delivers unbelievable artistic value. His master piece Le Reve is a show filled with unique artistic expressions that are displayed in the round on a stage that is surrounded by a large pool of water. After sunset there is the stunning multimedia attraction that can be found at the Lake of Dreams. This half hour show runs continuously on the Lake of Dreams where the forty foot waterfall is engulfed with holograms, puppetry and highly choreographed music with over 4,000 light displays. Guests can view the show while dining at Lakeside Seafood and the SW Steakhouse or while having drinks at the Parasol Up and the Parasol Down. 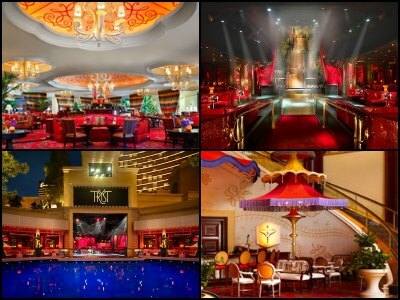 The Wynn Hotel Las Vegas offers some exciting nightlife experiences that can only be found at a Steve Wynn property. 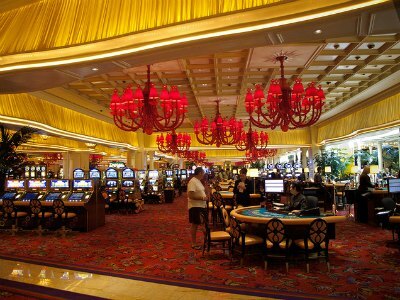 There are numerous casino bars to help fuel the energy found around the casino area. The Parasol Up Bar is perfectly situated for a view of the forty feet waterfall that empties into the Lake of Dreams below and the Wynn Hotel complex; a spiraling escalator will transport you to the Parasol Down Bar that features stunning views of the Lake of Dreams and signature cocktails; the Blush Lounge is an ideal location for the hip party goer looking for fun. The Wynn Hotel Las Vegas sports one of the largest casinos on the Strip at 110,000 square feet. This casino has tremendous energy and all of your favorite games are available from craps to roulette to blackjack to over 1,900 slots and video poker machines. There is also poolside blackjack at the Cabana Bar. There is also a 26 table poker room that offers everything from Texas Hold’Em to Caribbean to Pai Gow to three card stud. The Wynn Hotel also has a spacious 195 seat race and sports book that offer action on your favorite teams in a plush setting. The New Buffet at Wynn Hotel Las Vegas is a delightful light and airy space with lots great food selections. The interior is bright with lots of colors, flowers and stainless steel. The cuisine at the buffet will surpass all of your imagination with fifteen action cooking stations that are offering food from around the world. The fresh ingredients are evident in the estimated 120 dishes prepared for the guests. Cuisine includes seafood, omelets, waffles, grilled meats, pizza, Chinese and many more delicious flavors. Dessert is taken to a new height by the professionally trained pastry chefs and includes a variety of chocolate dipped creations. The New Buffet at Wynn is open for breakfast, lunch and dinner. There is also an exquisite brunch on the weekends for guests to enjoy. Dining at the Wynn Hotel Las Vegasl includes over fifteen choices of restaurants that boast unique cuisine. Guests can find any type of tempting food their pallet is looking for at the Wynn Buffet that features over ten action cooking stations. Guests looking for casual dining options can indulge in delicious bistro cuisine at Red 8; the Allegro boasts superb Italian dishes prepared by Chef Enzo Febbraro; La Cave-Wine and Food Hideaway serves up small plates in an elegant garden setting overlooking the Wynn pool; the Terrace Pointe Café is perfect for that breakfast, lunch or dinner in an informal but sophisticated atmosphere; the Drugstore Café serves up a variety of quick sandwiches, salads as well as pastries and guests can also experience a decadent Rueben sandwich at Zoozacrackers Deli. On the fine dining side patrons can enjoy ocean-to-table seafood by Chef Mark LoRusso at Costa di Mare; there is succulent certified Kobe beef and Japanese delicacies by Chef Devin Hashimoto at Mizumi; guests of the Wynn Tower Suites can enjoy a complimentary breakfast at Tableau; Chef Ming Yu delivers traditional Cantonese, Szechuan and Shanghai cuisine with a new twist at Ming Lei; Chef David Walzog prepares dry aged steaks at SW Steakhouse and exotic seafood cuisine next to the Lake of Dreams at Lakeside Seafood. There is also New Orleans influenced cuisine prepared by Chef Rene Lenger at the Country Club which overlooks the gorgeous Wynn Golf Course. 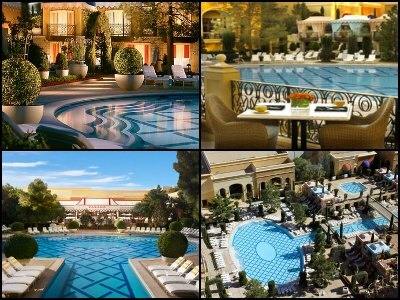 There is a vast pool area located at the Wynn Hotel Las Vegas with four different pools for guests to soak up the sun. All four of the pools are heated and there are two hot tubs situated on the main pool deck. The area is lush with plants and plenty of deck chairs. Cabanas and daybeds are also available for that personal VIP experience that only Wynn Hotel can deliver. The Tower Suites pool is exclusive to guests staying in the Tower Suites and you can enjoy a variety of eclectic cuisine at Tableau. Patrons of the Sunset pool can enjoy innovative dishes and signature cocktails at either the Cabana Bar or the Sunset Grill. There is also one adult only pool that is secluded and is dedicated to European sunbathing. The Wynn Hotel Las Vegas is the only property on the strip that features an eighteen hole golf course. Designed by Tom Fazio and Steve Wynn, the Wynn Golf Club highlights terrain that you might find in South Carolina or the Outer Bank Islands. Rolling hills, white sand bunkers and plenty of water hazards will challenge your shot making all day. The staff at Wynn will ensure that your room-to-tee box experience is similar to a first rate country club. There is also the Country Club restaurant that serves delicious cuisine and boasts stunning views of the eighteenth hole. The WWynn Hotel Las Vegas can make your special wedding day something to remember forever. The Lilac Salon has an intimate feeling while providing services for up to 65 patrons and the Lavender Salon has a floral theme décor and can accommodate up to 120 guests. If you choose outside for your special engagement then the Primrose Courtyard is perfect for hosting up to 100 people. The Wynn also offers unique wedding locations at the Lake of Dreams Terrace and the Tryst Nightclub that includes a private lagoon. The Wynn offers many different wedding packages as well as having expert wedding planners on staff that can guide couples through the fine details of their special day. The SPA at Wynn Hotel Las Vegas is a beautiful space that incorporates a soft and vibrant décor that will place your mind as well as your body in a peaceful state. Once you enter the space filled with sunlight and mesmerizing fountains at the Spa at Wynn, you know why this was the first spa in Las Vegas to win a Forbes Travel Guide Five Star award. There are 45 private message rooms, a co-ed space as well as separate wet areas for men and women. The wet areas offer cold plunge pools, a deluge shower and whirlpool tubs for everyone’s enjoyment. One of the couple’s private rooms boasts a romantic fireplace for that intimate experience. 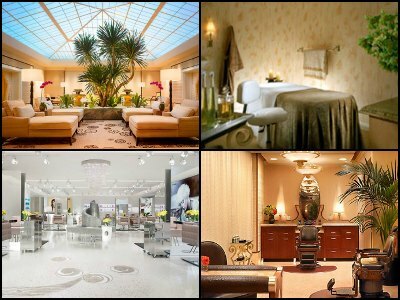 People can mix several of their favorite treatments or they can choose one of the many specialty treatments like the White Tea and Seaweed Body Quencher or the Thai Oil Fusion Massage that are offered by the SPA at Wynn. 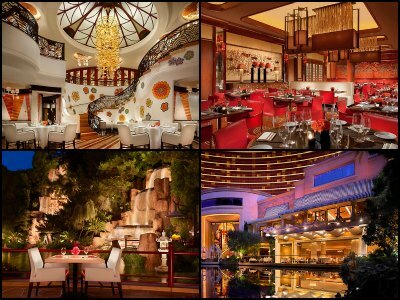 The shopping at Wynn Hotel Las Vegas is located along the Wynn Esplanade that is situated near the Lake of Dreams and the garden atrium. The seventeen shops all feature exciting fashion and accessories from the biggest names in the luxury brand space. Patrons can find men and women fashion at the Wynn Collection as well as a Vacheron watch at Wynn and Company Watches; Tiny Treasures features fine toys and educational games; the perfect watch awaits guests at Rolex; Oscar de la Renta boasts luxury fashion for both sexes; Manolo Blahnik showcases trendy shoes; from luggage to shoes Louis Vuitton has it all; fine jewelry can be found at Graff; the latest French fashions can be browsed at Givenchy; for that perfect fragrance or classic fashion try Dior; One-of-a-kind jewelry is highlighted at Chopard; Chloe offers luxurious apparel for females; trendy fashion with timeless lines is available at Chanel; feel like royalty when you enter Cartier; Brioni has tailor made suits for men and Alexander McQueen features high-end fashion for men and women.